Kalzang Gyatso (Tib. སྐལ་བཟང་རྒྱ་མཚོ་, Wyl. skal bzang rgya mtsho) (1708–1757), the Seventh Dalai Lama, was born in the Lithang province of East Tibet. He received the name of Kalzang Gyatso from a wandering mystic. Following a vision of Tsongkhapa, who told him to go to Lhasa, he left Lithang in 1716 and journeyed through Kham, staying for a while at Kumbum Monastery before eventually arriving in Lhasa, where he was enthroned at the Potala Palace in 1721. He received both getsul and gelong vows from the Panchen Lama Lobzang Yeshe. He died in 1757 in the Potala palace. 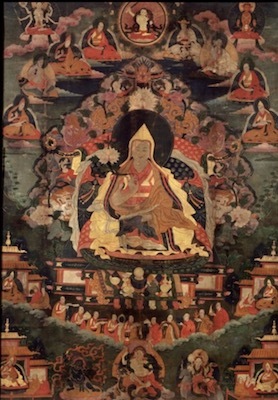 His students include the great scholar Changkya Rolpé Dorje who also composed his biography. This page was last edited on 3 May 2018, at 22:15.